Content: Are you looking for a smart device to manage your health? Goo Connect has a wide range of wellness devices that can help you improve your sleep and get back into a physical activity that suits your needs and wishes. Goo’s sleep tracker measures your real-time oxygen levels and heart rate variability (HRV) to detect possible sleep apnea. As soon as the critical threshold is exceeded, this smart band alerts you through a notification and alarm system. An ideal device for managing sleep problems, using the sleep tracker means you can seek advice if necessary. 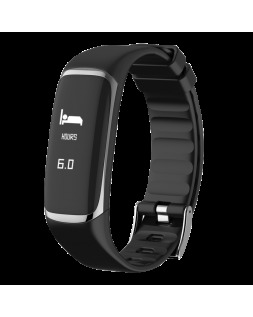 Other smart devices for monitoring wellness include the Goo Activ activity band range. Available in black, white and blue, this smart device for monitoring your health tracks your heart rate, blood pressure, number of steps taken, and calories burned. That way you're fully aware of your physical condition when walking, running or exercising. The band is paired with a smartphone app, available on both iPhone and Android smartphones, which allows you to analyse your data in detail and thus be aware of what progress you've made. Enjoy your music and stay in touch with your surroundings with bone conduction technology.